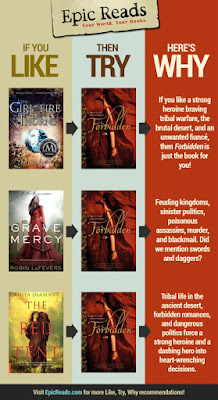 6 BANISHED Cover Reveal + Giveaway! 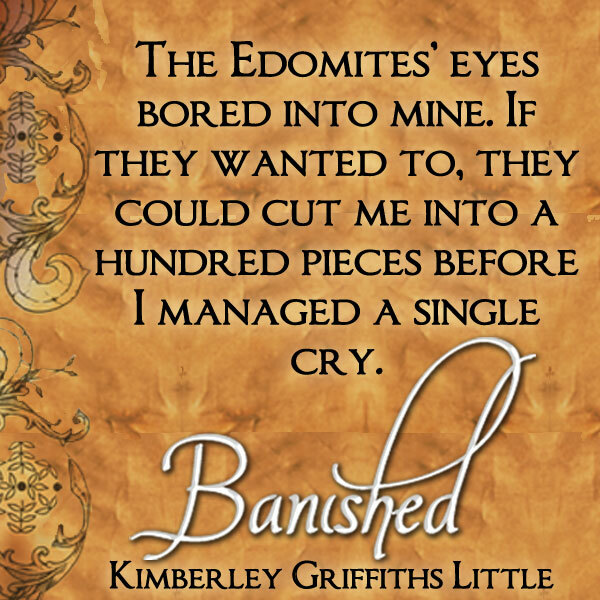 We're honoured today to present the exclusive cover of BANISHED, the second book in the FORBIDDEN trilogy by Kimberley Griffiths Little! “At its core, this is a romance, with all the push and pull that goes along with impossible love, and Little elevates the story by creating a perilous landscape, both outward and inward, as Jayden must deal with the hardship of desert life as well as her own desires.” Little elevates the story by creating a perilous landscape, both outward and inward, as Jayden must deal with the hardship of desert life as well as her own desires." "Lush, lyrical, romantic. Forbidden transports readers into a vividly imagined place and time." "The beauty of the desert of ancient Mesopotamia comes to life in Forbidden . . .Your heart will break as you root for Jayden to triumph over the struggles that tear her world apart, and the ending will leave you thirsting for more!" Kimberley Griffiths Little grew up in San Francisco, but now lives in an adobe house on the banks of the Rio Grande with her chaotic, messy family. She’s drunk so much Land of Enchantment water that some of that ancient magic got into her blood and now spurts out her pencil—um, ergonomic keyboard. Kimberley has slept in the haunted tower room at Borthwick Castle in Scotland, sailed the Seine in Paris, walked the beaches of Normandy, ridden a camel in Petra, shopped the Grand Bazaar in Istanbul, and spent the night in an old Communist hotel in Bulgaria. The official book trailer is compelling. How did you go about making it? Fun story: I’ve created book trailers for my MG novels, too, and I love writing the script and planning out the shots and locations. For FORBIDDEN I wanted it to truly look like an actual movie. I hired a young man I’ve known since he was young who got his film degree from Columbia in New York. After we discussed the script we decided to focus on Jayden and not clutter the trailer with too many shots or stills. The entire trailer is live action. Justin found a location in southern Utah called Little Sahara Sand Dunes that looks VERY much like the country of Jordan and its mountains (where Jayden and Kadesh’s first romantic declarations occur). Justin met Sela, the actress, on the set of another film. Sela is actually Tongan, but looks just like the Bedouin girls I met in the ancient city of Petra, beautiful and exotic. (She’s also 5’11” tall and is in the midst of call-backs for Disney’s new princess, Moana.) Sela’s mother is a makeup artist and in one afternoon they did all the shooting. Justin and I spent about 2-3 weeks choosing the footage and editing. I planned out the opening titles and credits and sent Justin the graphics and fonts he needed. The end result is gorgeous and interestingly enough the book trailer fits for BANISHED in many ways, too. EVERYBODY WHO Orders or Pre-orders copies of the books receives a set of gorgeous BOOK CLUB CARDS and an autographed book plate! And don't forget to check out the rest of the tour for more exclusive content! 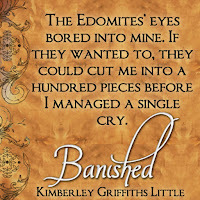 What did you think of the cover of BANISHED by Kimberely Griffiths Little? Let us know in the comments! I love the quote at the top. This looks really, really good. And the cover is gorgeous. Thanks for this post. Thanks so much for checking out Banished and the lovely kudos, Rosi!